Stratocumulus perlucidus clouds, as seen from an airplane window. A cloud is a visible mass of condensed droplets, frozen crystals suspended in the atmosphere above the surface of the Earth or other planetary body, such as a moon. (The term cloud is also applied to a mass of material in interstellar space, where it is called an interstellar cloud or nebula.) The scientific study of clouds is called nephology, which is a branch of meteorology. On Earth, clouds play an important part in the water cycle (hydrologic cycle). As evaporation occurs from the surface of oceans, lakes, rivers, and other exposed bodies of water, the vapor becomes part of the atmosphere and later condenses to form small droplets or ice crystals, typically 0.01 millimeter (mm) in diameter. When surrounded by billions of other droplets or crystals, they become visible as clouds. Eventually, the water precipitates in the form of rain, snow, and so forth, nourishing the Earth and replenishing the stores of freshwater on land. In addition, clouds regulate the Earth's climate, based on the amount of radiation they reflect and absorb from the Sun and the Earth. Dense deep clouds exhibit a high reflectance (70-95 percent) throughout the visible range of wavelengths: they thus appear white, at least from the top. Cloud droplets tend to scatter light efficiently, so that the intensity of the solar radiation decreases with depth into the cloud, hence the gray or even sometimes dark appearance of the clouds at their base. Thin clouds may appear to have acquired the color of their environment or background, and clouds illuminated by non-white light, such as during sunrise or sunset, may be colored accordingly. 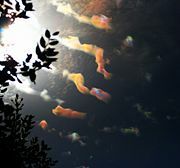 In the near-infrared range, clouds would appear darker because the water that constitutes the cloud droplets strongly absorbs solar radiation at those wavelengths. Global scheme of cloud optical thickness. Clouds may be formed by several different mechanisms. when warm air blows over a colder surface, such as a cool body of water. 2. Clouds can be formed when two air masses below saturation point mix. Examples are: the condensation of vapor in human breath on a cold day, aircraft contrails, and Arctic sea smoke. 3. The air stays the same temperature but absorbs more water vapor into it until it reaches saturation point. The water in a typical cloud can have a mass of up to several million tonnes. 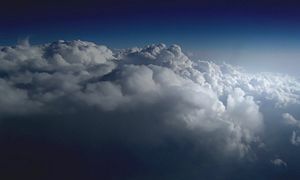 The volume of a cloud is correspondingly high and the net density of the relatively warm air holding the droplets is low enough that air currents below and within the cloud are capable of keeping it suspended. Conditions inside a cloud are not static: water droplets are constantly forming and re-evaporating. A typical cloud droplet has a radius on the order of 1 x 10-5 m and a terminal velocity of about 1-3 cm/s. This gives these droplets plenty of time to re-evaporate as they fall into the warmer air beneath the cloud. Most water droplets are formed when water vapor condenses around a condensation nucleus, such as a tiny particle of smoke, dust, ash or salt. In supersaturated conditions, water droplets may act as condensation nuclei. Water droplets large enough to fall to the ground are produced in two ways. The most important means is through the Bergeron Process, theorized by Tor Bergeron, in which supercooled water droplets and ice crystals in a cloud interact to produce the rapid growth of ice crystals; these crystals precipitate from the cloud and melt as they fall. This process typically takes place in clouds with tops cooler than -15 °C. The second most important process is the collision and wake capture process, occurring in clouds with warmer tops, in which the collision of rising and falling water droplets produces larger and larger droplets, which are eventually heavy enough to overcome air currents in the cloud and the updraft beneath it and fall as rain. As a droplet falls through the smaller droplets that surround it, it produces a "wake" which draws some of the smaller droplets into collisions, perpetuating the process. This method of raindrop production is the primary mechanism in low stratiform clouds and small cumulus clouds in trade winds and tropical regions and produces raindrops of several millimeters diameter. This wave cloud pattern formed off of the Île Amsterdam in the far southern Indian Ocean. The actual form of the cloud created depends on the strength of the uplift and on air stability. In unstable conditions, convection dominates, creating vertically developed clouds. Stable air produces horizontally homogeneous clouds. Frontal uplift creates various cloud forms depending on the composition of the front (ana-type or kata-type warm or cold front). Orographic uplift also creates variable cloud forms depending on air stability, although cap cloud and wave clouds are specific to orographic clouds. In addition to being the colloquial term sometimes used to describe dry ice, "hot ice" is the name given to a surprising phenomenon in which water can be turned into ice at room temperature by supplying an electric field on the order of one million volts per meter.). The effect of such electric fields has been suggested as an explanation of cloud formation. This theory is highly controversial and is not widely accepted as the mechanism of cloud formation. The first time cloud ice forms around a clay particle, it requires a temperature of -10 °C, but subsequent freezing around the same clay particle requires a temperature of just -5 °C, suggesting some kind of "ice memory." 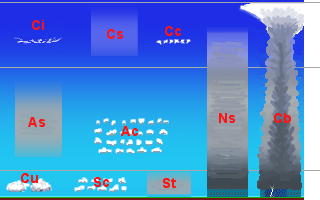 Cloud classification by altitude of occurrence. Clouds are divided into two general categories: layered and convective. These are named stratus clouds (or stratiform, the Latin stratus means "layer") and cumulus clouds (or cumuliform; cumulus means "piled up"). These two cloud types are divided into four more groups that distinguish the cloud's altitude. Clouds are classified by the cloud base height, not the cloud top. This system was proposed by Luke Howard in 1802 in a presentation to the Askesian Society. These generally form above 16,500 feet (5,000 m), in the cold region of the troposphere. In Polar regions, they may form as low as 10,000 ft (3,048 m); they are denoted by the prefix cirro- or cirrus. At this altitude, water frequently freezes so clouds are composed of ice crystals. The clouds tend to be wispy and are often transparent. Contrail, a long thin cloud which develops as the result of the passage of an aircraft at high altitudes. These develop between 6,500 and 16,500 feet (between 2,000 and 5,000 m) and are denoted by the prefix alto-. They are made of water droplets and are frequently supercooled. These are found up to 6,500 feet (2,000 m) and include the stratus (dense and grey). When stratus clouds contact the ground, they are called fog. A cloud in a gradient blue sky. An example of various cloud colors. The color of a cloud tells much about what is going on inside the cloud. Clouds form when relatively warm air containing water vapor is lighter than its surrounding air and this causes it to rise. As it rises it cools and the vapor condenses out of the air as micro-droplets. These tiny particles of water are relatively densely packed and sunlight cannot penetrate far into the cloud before it is reflected out, giving a cloud its characteristic white color. As a cloud matures, the droplets may combine to produce larger droplets, which may combine to form droplets large enough to fall as rain. In this process of accumulation, the space between droplets becomes larger and larger, permitting light to penetrate much farther into the cloud. If the cloud is sufficiently large and the droplets within are spaced far enough apart, it may be that a percentage of the light which enters the cloud is not reflected back out before it is absorbed (Think of how much farther one can see in a heavy rain as opposed to how far one can see in a heavy fog). This process of reflection/absorption is what leads to the range of cloud color from white through gray through black. For the same reason, the undersides of large clouds and heavy overcasts appear various degrees of gray; little light is being reflected or transmitted back to the observer. Other colors occur naturally in clouds. Bluish-gray is the result of light scattering within the cloud. In the visible spectrum, blue and green are at the short end of light's visible wavelengths, while red and yellow are at the long end. The short rays are more easily scattered by water droplets, and the long rays are more likely to be absorbed. The bluish color is evidence that such scattering is being produced by rain-sized droplets in the cloud. A greenish tinge to a cloud is produced when sunlight is scattered by ice. A cumulonimbus cloud which shows green is a pretty sure sign of imminent heavy rain, hail, strong winds and possible tornadoes. Red, orange, and pink clouds occur almost entirely at sunrise/sunset and are the result of the scattering of sunlight by the atmosphere. The clouds are not that color; they are reflecting the long (and unscattered) rays of sunlight which are predominant at those hours. The effect is much the same as if one were to shine a red spotlight on a white sheet. In combination with large, mature thunderheads this can produce blood-red clouds. The evening before the Edmonton, Alberta tornado in 1987, Edmontonians observed such clouds — deep black on their dark side and intense red on their sunward side. In this case the adage "red sky at night, sailor's delight" was wrong. The recently recognized phenomenon of global dimming is thought to be caused by changes to the reflectivity of clouds due to the increased presence of aerosols and other particulates in the atmosphere. Recent research by Martin Wild and coworkers indicates a global brightening trend. Global brightening is caused by decreased amounts of particulate matter in the atmosphere. With less particulate matter, there is less surface area for condensation to occur. Since there's less condensation in the atmosphere and increased evaporation caused by increasing amounts of sunlight striking the water's surface there is more moisture, causing fewer but thicker clouds. In mountainous areas one often finds the peaks above the clouds as here for the Pico Ruivo seen from Pico do Arieiro, Portugal. ↑ Choi 2005, The SAO/NASA Astrophysics Data System. Retrieved February 21, 2008. Day, John A. 2005. The Book of Clouds. New York, NY: Sterling Publishing Co. ISBN 1402728131. Day, John A., and Vincent J. Schaefer. 1998. Peterson First Guide to Clouds and Weather. 2nd ed. Boston: Houghton Mifflin. ISBN 0395906636. Pretor-Pinney, Gavin. 2007. The Cloudspotter's Guide: The Science, History, and Culture of Clouds. New York, NY: Perigee Trade. ISBN 0399533451. Hamblyn, Richard. 2002. The Invention of Clouds: How an Amateur Meteorologist Forged the Language of the Skies. New York, NY: Picador; Reprint edition. ISBN 0312420013. BadMeteorology's explanation of why clouds form. Cloud Appreciation Society – Aesthetics of clouds. Shuttle Views the Earth: Clouds from Space. This page was last modified on 6 March 2017, at 20:43.